A portable USB hard drive is a great way to back up data but what if your USB ports are unable to supply enough "juice" to power the drive? A modified version of the Silicon Chip Usb Power Injector is the answer. For some time now, the author has used a portable USB hard drive to back up data at work. As with most such drives, it is powered directly from the USB port, so it doesn’t require an external plug pack supply. 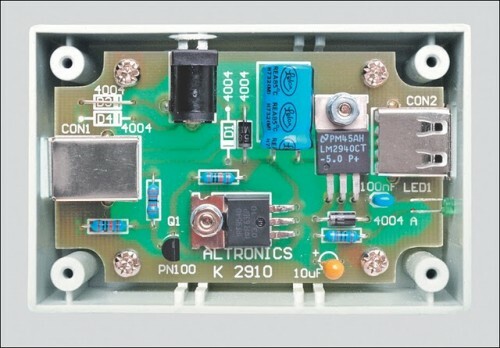 In fact, the device is powered from two USB ports, since one port is incapable of supplying sufficient current. That’s done using a special USB cable that’s supplied with the drive. It has two connectors fitted to one end, forming what is basically a "Y" configuration (see photo). One connector is wired for both power and data while the other connector has just the power supply connections. In use, the two connectors are plugged into adjacent USB ports, so that power for the drive is simultaneously sourced from both ports. An external USB hard drive is usually powered by plugging two connectors at one end of a special USB cable into adjacent USB ports on the computer. 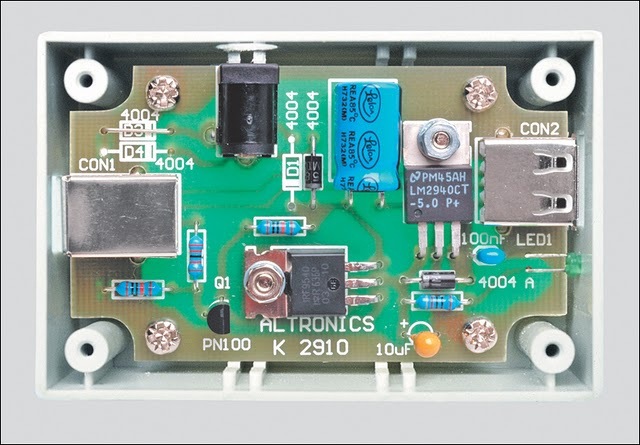 This allows power to be sourced from both ports. 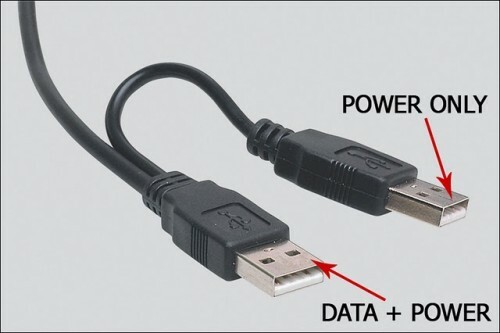 According to the USB specification, USB ports are rated to supply up to 500mA at 5V DC, so two connected in parallel should be quite capable of powering a portable USB hard drive – at least in theory. Unfortunately, in my case, it didn’t quite work out that way. Although the USB drive worked fine with several work computers, it was a "no-go" on my home machine. Instead, when it was plugged into the front-panel USB ports, the drive repeatedly emitted a distinctive chirping sound as it unsuccessfully tried to spin up. During this process, Windows XP did recognise that a device had been plugged in but that’s as far as it went – it couldn’t identify the device and certainly didn’t recognize the drive. Plugging the drive into the rear-panel ports gave exactly the same result. The problem wasn’t just confined to this particular drive either. A newly-acquired Maxtor OneTouch4 Mini drive also failed to power up correctly on my home computer, despite working perfectly on several work computers. 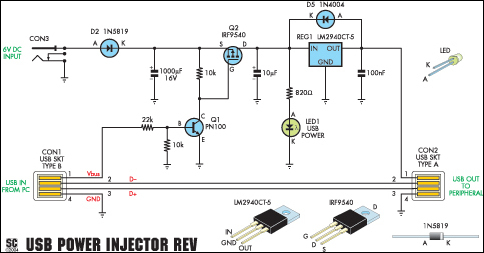 The revised USB Power Injector is essentially a switch and a 5V regulator. 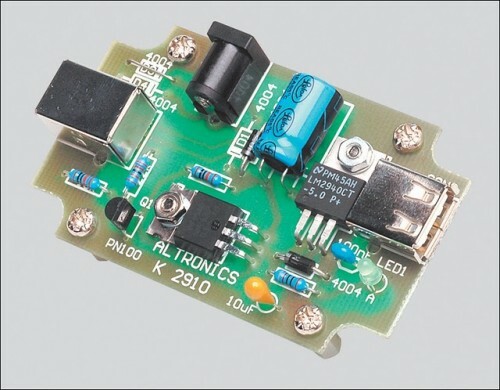 The Vbus supply from USB socket CON1 turns on transistor Q1 which then turns on power Mosfet Q2. This then feeds a 6V DC regulated supply from an external plug pack to regulator REG1 which in turn supplies 5V to USB socket CON2.